Kevin: New York Times announces layoffs and a hiring freeze. It will also examine its coverage priorities. Kevin: It says what it does on the tin. Easy blog design for all of those CSS-challenged among us. Kevin: Ryan Sholin lists five sites and services that can allow news sites to begin innovation today. Not tomorrow after you sign off a deal or buy in consultants or developers. Now. This is a much overlooked part of Web 2.0 innovation. Geotagged News and Drupal: Why Wait? Kevin: Benjamin Melançon asks: What’s to stop us from doing cool things with geotagged news with Drupal or other existing free software tools? Good question. Kevin: This was a dumb, poorly financed deal based on a best case scenario that never was going to happen. With the sub-prime meltdown hitting real estate and classified ads, it’s only going to get worse. Kevin: Steve Outing shares lessons from the Enthusiast Group’s effort to launch outdoor sports focused community groups. In the end, they have closed the business, but they have learned a lot about media, community and UGC. Last night, Suw and I went to Reuters headquarters in Canary Wharf for an Online News Association event. Reuters was talking about its MJT – mobile journalism toolkit (they used to call it MoJo for mobile journalism but for some reason aren’t using the term any longer). Reuters partnered with Nokia to develop the toolkit after working with the handset maker on a mobile Flash-lite application to highlight their content on the N95. Nokia is trying to understand the needs of journalists in the field and how that might drive development of special applications for consumer-oriented mobile phones like the N95. Reuters is exploring what is possible with the current generation of phones (and networks) while doing some experimentation with what types of story-telling this might allow. They also have slightly modified the RSS output from the phone’s production app and WordPress’ RSS intake to allow for some additional RSS elements that Reuters needs in order to handle content correctly. Video is uploaded direct to their hosting service and text goes straight to the blog platform, and an editor is automatically alerted that content has been sent for review and publication. The material can then be published to various platforms. The discussion was lead by Ilicco Elia, Mobile Product Manager Europe; alongside Mark Jones, Global Community Editor; Matt Cowan, European Technology, Media and Telecommunications Correspondent; and Nic Fulton, chief scientist for Reuters media. Ilicco gave an overview of how Reuters and Nokia decided to work together. We see in five years, HD video, extremely powerful CPUs. You might say it’s a laptop, but it will still be a personal, mobile device. They worked directly with Timo Koskinen, the project manager for Nokia’s research centre. Matt Cowan talked about his experience with the toolkit, showing video he shot of Vint Cerf at the Media Guardian’s Edinburgh TV festival. My colleague Jemima Kiss has an overview of the experiment and talked with Matt about the toolkit for the Guardian’s digital content blog. Before joining Reuters, Matt worked for Canadian CTV covering California. There he did work shooting and editing his own pieces, so he had experience with multimedia reporting. Matt said that he fed back his experiences directly to Nokia. The phone is a bit difficult to hold steady, which isn’t surprising – it’s not like balancing a hefty traditional TV camera on your shoulder, which provides some stability. I’ve experienced this same problem myself, first hand, doing a video journalism project for the BBC in 2003. I used a Sony PD150, a ‘pro-sumer’ digital video camera. Doing handheld work takes practice because the light camera is much easier to shake, despite built-in motion compensation. Matt talked later about this would allow journalists to develop relationships with the audience. There were slightly predictable questions about quality. One of the journalists said “cutting quality is a fancy way of saying cutting corners”. One of the shots, an opportunity shot backstage at a New York fashion show was a bit jerky, and one person asked what the point of the video was. I don’t think that this will change everything overnight. It is an incredibly exciting tool. It will change how we report certain stories. … It’s not ‘I’m here in front of this building, and this happened 10 hours ago’. You have immediate interaction, an intimacy. You’re in the environment. As Howard Owens recently said after widely circulated comments from Rob Curley about the difference between mindset and skillset, having the right skills doesn’t mean that someone is open to innovation and entrepreneurial ideas. Owens calls it the difference between a fixed mindset and a growth mindset. You don’t make “quality” a religion and refuse to try new forms of reporting because it doesn’t immediately meet your quality standards. You are willing to try and fail, and keep trying until you get it right, and you don’t resent others doing the same. There were some comments about how we would see “Bloggers doing this in a year’s time”, but as Suw said last night, bloggers have been doing this for years. I often say that keeping an eye on bloggers and other grassroots media is a good way to find inspiration for new ways to get the story. I still remember at the 2000 Democratic Convention in Los Angeles seeing an IndyMedia reporter backing up as mounted police moved towards him. He has carrying a PowerBook with a webcam and an early wireless modem strapped on it, sending live video from the streets to the net. My role as community editor to create a bit of identity around editorial talent and be more open to the audience. We also want to be open to the web including the the blogosphere and build networks around our journalistic expertise. Reuters have their own blogs and their YouWitness user-submitted photo and story effort. They have invested in Pluck and its Blogburst aggregator service. They also partner with multi-lingual blog community Global Voices, including on their Reuters Africa project, and they have a carbon trading community. In 1999, I covered Hurricane Floyd as it made landfall in North Carolina for the BBC News website. I filed throughout the night, but after the storm passed, it knocked out electricity and phone lines throughout the eastern third of the state. I wasn’t able to file a number of pictures I had taken because I simply had no way to get them back to the back to base. Within months after the storm, I had a data cable for my mobile phone. As the mobile technology got better, I could do more in the field. In 2006, on a trip for the BBC’s World Have Your Say, I was able to use a 3G data card in the US to set up a mobile WiFi hotspot and keep us connected when standard communications channels failed. 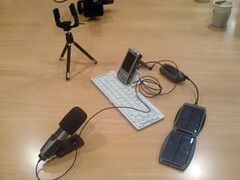 Mobile technology lets journalists stay closer to the story and connected not only to our office but also to our audience. The news organisations that experiment now will be best placed to take advantage of the journalistic possibilities that ever-advancing mobile technology allows. Tom Coates’ Comments on difference between tech in US, UK and France. Milbloggers to Journos: Can You Hear Us Now? Kevin: A great overview of milblogs, members of the military who blog. I’ve worked with several soldier bloggers to get another view of the wars in Iraq and Afghanistan. It’s an amazing, almost immediate view on the wars from a first person point of view. Kevin: Steve Outing writes about breaking news coverage via Twitter. I used Twitter to quickly write about a fire in London last week. It is good for alerts. Kevin: Steve Yelvington has a smart, nuanced response to a Guardian article decrying the death of sharp newspaper headline writing as newsrooms integrate. Print and web are two different media and require different approaches to succeed. Kevin: I’m loathe to link to Henry Blodget after his record as an analyst during the dot.com boom. But he points that the Washington Post’s newspaper business may slip into the red.